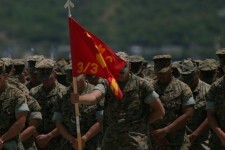 A memorial service was held Friday, between hangars 101 and 102, in honor of two Marines from 3rd Battalion, 3rd Marine Regiment, “America’s Battalion,” who were killed in action, May 8, while deployed with their unit to Afghanistan in support of Operation Enduring Freedom. Cpl. Richard P. Schoener and Lance Cpl. Nicholas C. Kirven, team leaders, 2nd Squad, 2nd Platoon, Kilo Company, 3/3, lost their lives in the Alishang District of Laghman Province, Afghanistan, during a fierce clash with insurgent fighters. While pursuing members of an Al Qaeda-affiliated militia force through local villages, Marines interpreted intelligence reports that led them to believe insurgents where planning an ambush. With that information in hand, the Marines continued to push forward until contact was made. When engaged in the first firefight, the two team leaders were at the head of their Marines. Kirven fired at an insurgent with a high-explosive 40 mm round from his M203 grenade launcher during his squad’s pursuit of the retreating insurgents. Kirven, 21, and Schoener, 22, were the first Marines to reach the insurgent’s body, which was lying by the opening to a cave. Schoener provided cover while Kirven checked the body. Almost immediately, the two came under fire from insurgents inside the cave. Both were severely wounded. The two Marines, Kirven from Fairfax, Va., and Schoener, a Hayes, La. native, although injured, continued to fight back, providing cover for their brothers in arms until two enemy grenades were tossed from the mouth of the cave, landing next to the heroes and ending their lives. The rest of the platoon quickly cleared the cave and finished the assault, although their main concerns were focused on Kirven and Schoener. True to the Marine Corps dictum, Marines never leave another behind, the members of their platoon, although dehydrated from the hours-long assault and journey to the objective, took turns carrying their fallen brothers more than five miles through rigorous mountain terrain back to the patrol base. That day, Mothers Day, Lt. Col. Norm Cooling, battalion commander, 3/3, made two phone calls he described as the most difficult calls he ever had to make. “During those calls, I clearly saw where they got their courage and selflessness,” he announced referring to the Marines’ families. Cooling described how Elizabeth Belle, Kirven’s mother, and Bonnie Breaux, Schoener’s mother, impressed him with their final words before the phone conversations ended. He explained how they both put their personal pain aside and told him to take care of the other Marines and bring them back safely. Fellow Marines and friends of the two fallen hero’s, said a few words to the families about how the young men had affected them throughout their time as fellow brothers in arms and how their optimistic and comical personalities never faltered. Cpl. Nick Collier, rifleman, 3/3, spoke about the plans he had made with Kirven and how the time they shared would always remain as uplifting memories of the good times the two friends had. Cpl. Nathan Valencia, rifleman, Kilo Company, 3/3, spoke about his time spent with Schoener and the impression his fellow Marine left on him. Kirven’s awards include the Bronze Star with combat distinguishing device, Purple Heart, Combat Action Ribbon, the National Defense Service Medal, the Afghanistan Campaign Medal, and the Global War on Terrorism Service Medal. Schoener’s awards include Bronze Star with combat distinguishing device, Purple Heart, Combat Action Ribbon, Good Conduct Medal, National Defense Service Medal, Afghanistan Campaign Medal, and the GWOTSM. His mother, Elizabeth A. Belle; his father, Rusty Kirven; brothers Joseph Belle and Joe Purcell; his sister, Mary-Pride Kirven; and his stepfather, Mike Belle, survive Kirven. His mother, Bonnie Breaux and his sister, Jesyca Schoener, survive Schoener. After two Hawai’i-based Marines were killed in Afghanistan in May, their battalion commander, Lt. Col. Norm Cooling, made the most difficult phone calls of his life. Cooling had called the mothers of Lance Cpl. Nicholas Kirven and Cpl. 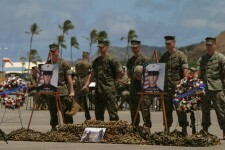 Richard Schoener, he said yesterday at a memorial ceremony for the two men at Marine Corps Base Hawai’i in Kane’ohe, where they had been stationed. They were killed May 8 — Mother’s Day — while battling insurgents in the Alishang District of Laghman Province. “During that call, I clearly saw where (the two) got their courage and selflessness,” said Cooling to the families of both Marines and members of the 3rd Battalion, 3rd Marine Regiment at the service. Cooling described how Elizabeth Belle — Kirven’s mother — and Bonnie Breaux — Schoener’s mother — told him to take care of the other Marines stationed there. Their platoon commander, 1st Lt. Sam Monte, attested to the bravery and work ethic of the pair, who were each team leaders — in charge of four Marines — in their 2nd Platoon, 2nd Squad of Kilo Company. Kirven, 21, of Richmond, Va., and Schoener, 22, of Bell City, La., were pursuing about 20 insurgents along with their dozen squadmates through local villages when Monte learned that the enemy planned an ambush, he said. A firefight ensued after some of the squad members crossed a river and scaled a 1,000-foot embankment. The two team leaders were at the front of the group, Monte said. Kirven was confirmed to have killed one fighter with his grenade launcher, and while Kirven and Schoener inspected the body, they noticed movement in a nearby cave. It was suspected to be occupied by the enemy, so it had been “softened up” by air strikes first, Monte said. When the pair went to investigate, they were ambushed with small arms fire. They managed to alert their squadmates before being killed by a fragmentation grenade, he said. Both Marines were awarded the Purple Heart and Bronze Star, which Cooling presented, wrapped in American flags, to their parents. “(The service) opens everything back up again but it makes us feel better,” Belle said of her family. “The hardest thing to do is hear about who (our son) was,” Breaux said. Kirven’s father Rusty, brother Joseph Belle, sister Mary Pride Kirven, stepfather Mike Belle, and stepmother Robin Purcell also flew in to attend the ceremony. Schoener’s stepfather Lawrence Breaux, sister Jesyca Schoener, and nephew Gavin also attended.